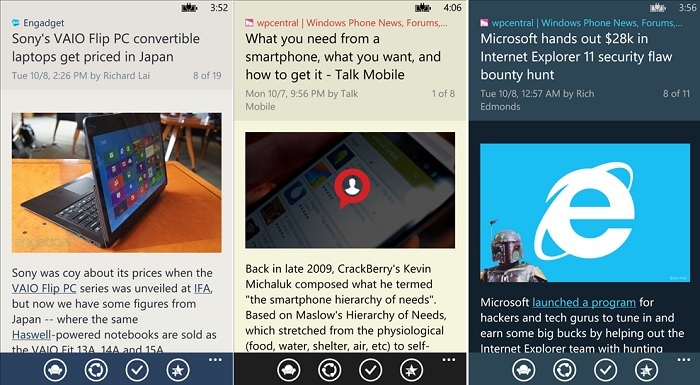 Nextgen Reader is a very popular Feedly client for Windows Phone devices, and brings several handy features at the table, including the ability to read your RSS feeds on the go, a simply and intuitive interface and more. Recently, Nextgen Reader for Windows Phone received an update, bumping it to version 5.5, and comes with several new features and bug fixes. New: Save images to phone (just tap and hold in article view). New: Article search is back with option to match title-only (please note that Feedly Pro account is required for complete search results). New: Save recent searches automatically, so you don’t have to type ever again. New: Set default CC and BCC for emails. New: Enable/disable flick gesture in article view. Updated: Support for Pocket v3 API. Please re-authenticate your account. Also, fixes the save to pocket issues. If you’re a regular users of the Nextgen Reader, head over to the Windows Phone Store and download the app.